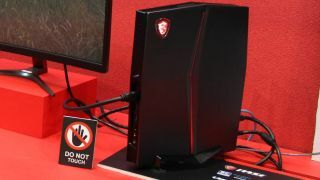 High-end gaming manufacturer MSI has unveiled its reinvented console-esque gaming desktop, the Vortex G25, at this year’s Computex in Taiwan. First appearing at CES 2016, MSI’s original Vortex (the G65) took the shape of a cylindrical tower that looked like a gamer’s rendition of a Mac Pro. But based on the sleek and slender design of the G25 Vortex, the latest iteration of the gaming computer seems to have consoles squarely in its sights. We’re told that the ‘25’ in the device’s moniker refers to its meager size and mass, with a 2.5L chassis and 2.5kg net weight. This slim unit can stand vertically, akin to something like Nvidia’s Shield gaming system or even one of the more recent Playstation consoles, relying on a ‘base’ to support it, or can lay flat on rubber feet. The Vortex’s case is furnished in typical MSI fashion — angled edges, matte black finish with glowing red trim, and the brand’s signature dragon badge thrown on for good measure. The high-octane appearance is paired with some appropriately beefy specs ready for the rigors of VR gaming, although the available options may vary from region to region. The unit can be powered with up to a seventh-gen core i7 Intel processor and a GPU up to Nvidia GeForce GTX 1070 with 8GB of DDR5 memory. There are four slots available for RAM, able to take up to 64GB total of DDR4, and for storage you can have up to two m.2 SSD connected via PCIE. You can simply and swiftly remove the bottom panel in order to upgrade either of these features and make any desired tweaks. All the usual connectivity suspects are present, with some easy-access USB 3.0 and headphone ports on the front of the device, as well as a USB Type-C connection capable of charging your VR devices with up to 5V, 3 of power. There’s also the latest in Thunderbolt connectivity, with 3.0 allowing for up to 40gbps transfer speeds, and the Vortex is capable of outputting in 4K at 60Hz. We don’t yet have pricing or availability on this beast but considering the highest-spec version of last year’s Vortex launched at $3,999 (around £2,834 and AU$5,375), we can definitely expect this to be a pricey piece. Check out the highlights from our extensive Computex 2017 coverage.